Do you ever have days when you're feeling a little down and need a little pick-me-up? One of my favorite things to do is listen to some of the old mixtape CD's Daniel used to make for me. From the very first Maui-inspired one that he brought to me (pictured above, he drew Hawai'i on it!) along with a sweet note and a succulent plant, to the one where every single lyric stirs crazy emotions and was so applicable to us at that specific moment... it's just a wonderful way to reminisce, and it always puts a smile on my face and makes my heart swell with love. Whether it's mixtapes, photos, or cards—if you're having one of those days—take a moment to look back at those memories and remind yourself how lucky you are to be loved. I can't tell you how many times I have been having a rough or down day and popped in one of his mixtapes, only to have all the negative feelings completely vanish and be replaced by joy, happiness, and of course—mushy, mushy love. If you're reading this today, I hope you know that I appreciate you. Each and every one of you. Thanks for being here & helping me build this blog into what it is today. I used to make mixtapes all the time! But I was always frustrated that I was limited to how many songs I could add (I make 100+ songs playlists on iTunes!). Then I found out I could use an FM transmitter and play my iPhone through my radio. And now, when I'm driving, all I listen to is Hunter Hayes, but I've got a huge stack of those CDs somewhere! This makes me smile for so many reasons...Hang onto that feeling! I'm sending you an article via e-mail that you should read too. Happy Thursday, lady! Such an awesome idea, I need to dig out old cds! So sweet! 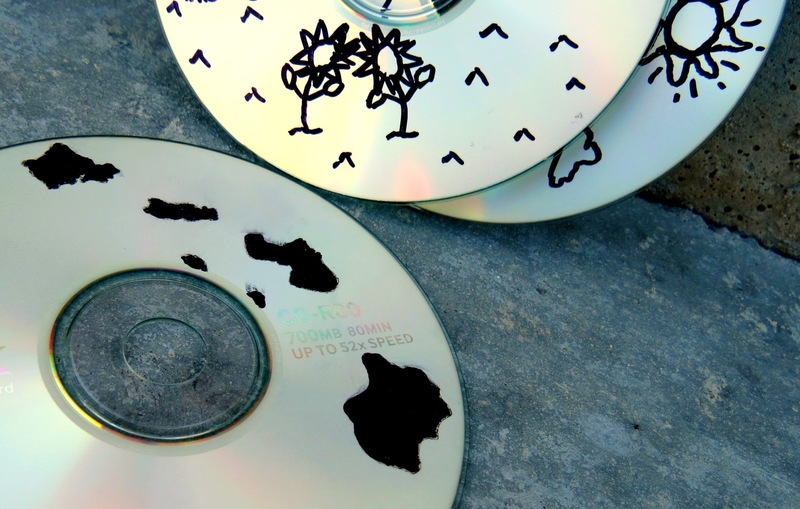 My best friend would make me cds and draw on them just like that! I made Izzy a mixtape last year for Valentine's Day and I also made myself a copy - I find myself listening to it ALL THE TIME. mix tapes are seriously the best! They hold the best memories,and sometimes always hold the answers we are looking for! That's awesome. I didn't even know you could do that! I don't have ANY music on my iphone. All I have is an old school shuffle! It was SO GOOD! I'm holding the feeling tight!! It's crazy how they can take you RIGHT BACK to those memories, like they were yesterday! So fun! The CD art was my favorite part of making them! That is so awesome he made you mix tapes! And so funny I read this today. Just last night I was telling Joe "I wish you made me mix tapes!" haha! They are so rad!!! Haha, yeah, my iPhone doubles as an iPod. I want to get one of those tiny shuffles so I can clip it on at the gym and leave my phone at home, but considering I've been to the gym twice this summer, I haven't gotten around to it. You should make him one! Though you probably do. My favorite is when they just mysteriously pop up in my car or in a little present. So unexpected! As strange as it sounds, this is exactly what I needed to read today. Thank you. Really. Yeah, I don't ever run. I usually stick my phone in the little tray on the elliptical at the gym and go! But then I get distracted by facebook and twitter and text messages. I'd leave it all at home if it weren't for my music! Without music, life would be a mistake right? Music can heighten all your senses and emotions .... and who doesn't adore a mix tape or playlist. I have playlists for housework, running, car trips, when I'm in the office etc. PS - Thanks for the mushy mushy LOVE. I love visiting you each day. It's been awhile since anyone gave me a mix CD but reading this post takes me right back to the last time it happened, and knowing that someone had taken the time and put all that thought into making it was just the best feeling ever. A feeling that can be relived each time you listen to it, which is the best part. And Daniel is the coolest guy ever for drawing Hawaii on that CD! Now that you mentioned this, I remembered the Valentines Day CD I made Bill when we first got together... kinda one of those things where you aren't together long enough to purchase a bunch of stuff, but a CD with a bunch of love songs is perfect.. I still listen to it. Like... daily ;) LMAO!! P.S. I have Disqus now. How do I get rid of the "reactions" part of it. It's annoying and I don't like it. Mix tapes are awesome! So are old photos! I have a digital photo frame in my kitchen, and I add more and more pictures onto it all the time. Good Day, Bad Day, Any Day, I walk by that frame and always see a picture of a good memory... and that makes me smile. Oh my goodness, YES! Cleaning out my childhood home I found all of those middle school mix tapes and popping them in the car it was awesome! Hope you're feeling better! Remember, you're stronger than you think & braver than you seem! Yeah, that's from Winnie the Pooh ;) xoxo! Thank you, Allison. I'm so glad. Always here to talk if you need anything! Oh man me and Twitter at the gym. We go crazy! Oh, Brooke. You're amazing. Thank you SO MUCH for adding me to your "5 blogs to bookmark list." Very flattering!! :) Have a wonderful day! You should have "the boo" make you one! Is he into that stuff? He made me that one right after he got home from Hawai'i, from a list of songs he listened to the whole time! Our Song is on that CD, and let me just say... it's by Bob Marley. Oh yeah. So fun. Those old CD's really are great. They just bring you right back! To answer your PS, go to Disqus>Settings>General and uncheck the box that says "enable reactions." Then go to your blog and DELETE (yes, DELETE) Disqus. Then go back to Disqus and re-install it on your blog. It should still all be merged and everything with your settings, but you have to do the delete>re-install to get the reactions to go away. I found that answer online after much searching a few months ago! I need to use mine! I have two and I really should take a minute to upload to them. Thanks for the idea!! The ones from middle school are PRICELESS. They can't be beat. Mine are filled with backstreet boys, avril lavigne, etc etc etc. So good! Kym, you are wonderful. We all have struggles, right? Mine are just a LOT right now! Thank you so much for your support. Soaking up some of that sunshine and sending it right back to you, too! I sure am. I'm on fire, Becca. Thank you for EVERYTHING lately! OK good! Glad it worked! Thanks girl! You're so sweet! Me and pinterest are the worst! I adore this post. One of my favorite things to do is look through old photos. Everyone else gets bored really quick but I love looking through all those old memories. They are so special. And mix cds? LOVE. I am the queen of making mix cds. For myself, my sister, pen pals, etc. I just think they are so fun and love to make them for people. I have those feeling down days more often than I would even want to say. I'm sorry you are having some of those too. Have a good rest of your weekend/nice Sunday, Aunie! It's so good to have you back, Emily!! :) Enjoy listening to those CD's... I bet it will be epic!